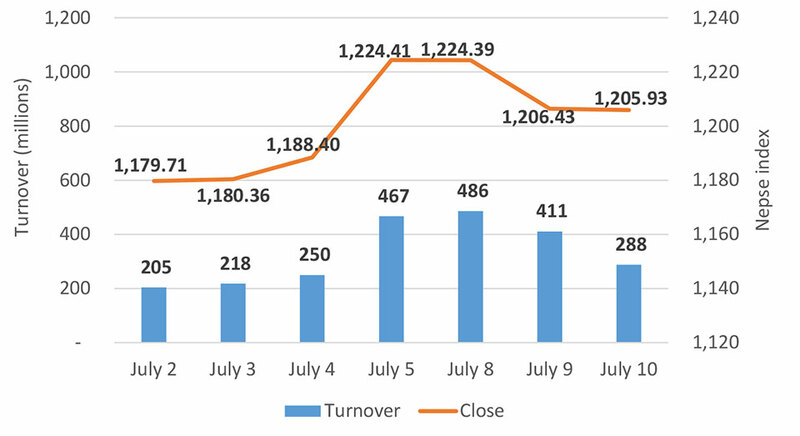 KATHMANDU: The stock market got off to a positive start on Tuesday, gaining 7 points mid-session. However, the market pared its early gains in the latter session before slipping into the negative territory. 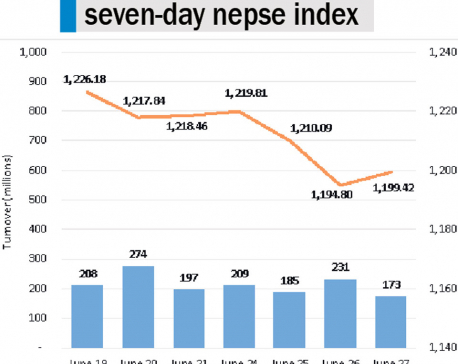 At the close, the benchmark Nepal Stock Exchange (Nepse) index stood at 1,205.93 points -- a drop of a meager 0.50 points compared to Monday. The lack of enthusiasm in the market indicates that the impending monetary policy has not been able to entice investors into taking new positions in the market. 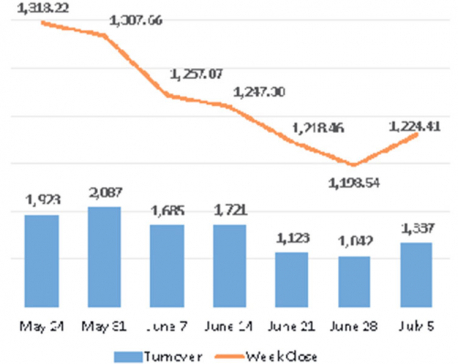 Consequently, daily turnover also subdued to Rs 287 million compared to the Rs 410 million of Monday. Weakness was visible among Manufacturing & Processing stocks as its sub-index declined by over 3 percent. The sub-indices of Others, Hydropower, Hotels, Microfinance and Development Bank also closed the day in red. On the other hand, sub-indices of Banking, Insurance and Finance ended in the positive territory. The most actively traded stock on the exchange on the day was Agriculture Development Bank Ltd which posted total turnover of above Rs 14 million. Next on the list were Nepal Telecom Ltd and Nepal Investment Bank Ltd which recorded turnover of Rs 11 million and Rs 9 million, respectively. Prime Life Insurance Company Ltd, Garima Bikas Bank Ltd Promoter Share, Nepal Life Insurance Company Ltd, Kumari Bank Ltd and Janata Bank Nepal Ltd Promoter Share recorded turnover of more than Rs. 7 million each. In terms of advances, Barun Hydropower Company Ltd was the top gainer of the day as its shares price rose 7.43 percent. Likewise, stocks of Hathway Finance Company Ltd, Samata Microfinance Bittiya Sanstha Ltd, United Finance Ltd and Kabeli Bikas Bank Ltd were also on the league table of top gainers. In contrast, share price of Western Development Bank Ltd plunged, locking into the negative circuit of 10 percent. Himalayan Distillery Ltd also shed over 6 percent. Among other, shares of Kankai Bikas Bank Ltd, Kalika Microcredit Development Bank Ltd and Laxmi Laghubitta Bittiya Sanstha Ltd also finished lower. In news, Securities Board of Nepal (Sebon) published Securities and Commodities Market Policies and Programs for fiscal year 2075/76 on Sunday. Infrastructural progress, regulatory supervision and development of legal structure in securities market are among the major issues addressed by the plan. ARKS technical analysis model depicts a small bearish candlestick formation in Tuesday's session as the market failed to hold to the intraday gains. Hence, the market is still likely to test the support zone of around 1,200-point level. Relative Strength Index (RSI) has slightly tilted toward the oversold zone following the losses seen in the last three days. Additionally, Moving Average Convergence/Divergence (MACD) is firmly embedded in the negative territory, suggesting the market is still in control of the bears in the present context.